Between elaborate costumes and neighborhood explorations, Halloween has always been one of my family’s favorite holidays. But the baskets of Snickers, Candy Corn, and Tootsie Pops can easily make October (and the following few months) a junk-food nightmare. Not to fear! That is why we designed the LMN Healthy Halloween Guide. These few simple tricks will keep you and your family from grazing on Halloween candy all year long, while still enjoying all of the spooky perks that the holiday has to offer. Before taking your little witches and werewolves out for trick-or-treating, make sure that the whole family eats a substantial and well balanced meal. Choose foods that will keep you full, like lean protein and high fiber foods, so Candy Corn doesn’t become the main meal of the evening. Eating a combination of these foods will ensure that you don’t go from house-to-house famished, and will allow you to mindfully choose your treat, rather than having your hunger make the choice for you. Trick-or-treating, pull out a map of your neighborhood and make a walking plan with your children or spouse in order to maximize physical activity. Take a detour and walk in the park, take notice of all the decorations and costumes, stop by a haunted house – try and put energy into activities other than the candy collecting, and use Halloween as an opportunity to get those extra steps in. If you live in a city and are trick or treating in an apartment building, choose the stairs over the elevator to keep your family active. Have your child pick out a few pieces of their favorite candy to enjoy and then make a decisive plan about how to allocate the rest for other activities. Get creative! Make a healthy trail mix station with your children, and let them first fill their bags with whole grain cereals, chopped nuts, and dried fruit before adding a few pieces of M&Ms or their favorite candy; use it to explain math-based problems or as “bargaining chips” in board games; save it for an arts and crafts project, such as gingerbread house decorating; or donate it to a local food shelter or Operation Gratitude. 4. Mindfully Indulge – it’s Halloween! Consciously indulge in 1-2 pieces of your favorite candy with zero guilt – it is Halloween after all! If you don’t listen to your cravings and allow yourself a conscious indulgence, you are more likely to secretly dip into that candy stash in the middle of the night and over do it. Pick one or two pieces of your favorite candy, wait until you are home and sitting, and really enjoy it. If you want to take that extra step, check out our Halloween Candy Guide, and make you indulgence just a bit more nutritious. 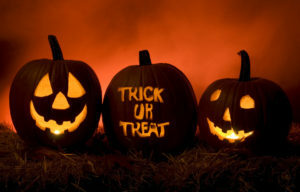 Halloween candy is often packed with sugar, hydrogenated oils, artificial colors and preservatives. This year, we came up with this quick and easy candy guide, so you can make an informed decision and enjoy a mindful and healthier indulgence. As a rule of thumb, it is always a smarter choice to choose chocolate over hard candies. Hard candies, like nerds or lollipops, are often loaded with refined sugar, and create acid when chewed, dissolving tooth enamel and causing cavities. Not to mention their bright colors come from dangerous food dyes, like Red #40. Instead, look for dark chocolate varieties: these options will provide you with some flavonoids from the chocolate, and healthy fats. So when it comes to choosing between Jolly Ranches and Reese’s, we urge you to pick the latter.